Since leaping to fame in 2008, Lady Gaga has frequently been compared to Madonna. But the comparisons hit new heights last year when her No.1 single Born This Way was accused by some critics of emulating Madonna's 1989 hit Express Yourself. And after keeping quiet over the comparisons for nearly a year, Madonna has finally broken her silence. Speaking on ABC show 20/20, the 53-year-old admitted she thought Born This Way sounded 'familiar' when she first heard it. When presenter Cynthia McFadden asked whether Madonna thought Gaga was 'copying' her, she initially praised the 25-year-old. She said: 'She's a very talented artist. Describing Gaga's work, she added: '(Her songs seem to be a) statement about taking something that was in the Zeitgeist, you know, 20 years ago and turning it inside out and reinterpreting it.. Attempting to get Madonna to explain the word reductive - which means 'minimal' or 'crude', McFadden asked whether that was 'a good or bad thing', the singer replied: 'Look it up,' before smirking. In an interview last year, Gaga was opened about Madonna's influence on her Born This Way album. She said: 'I genuinely love her so much. I think she is so amazing. She could never be replicated and, yes, I’m Italian, I’m from New York, and not for nothing, it’s not my fault that I kind of look like her, right? 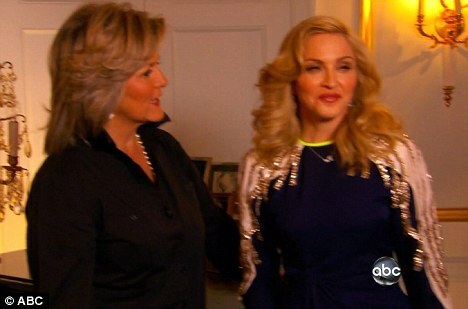 Despite any ill-feeling Madonna may have for her younger contemporary, the women have been pictured together several times. In 2010, they even took part in a catfight skit on Saturday Night Live.